How awesome is that? But dig on those stats for a minute, won't you? Slugging percentage and batting average are the only calculated statistics offered. Everything else is a counting stat. 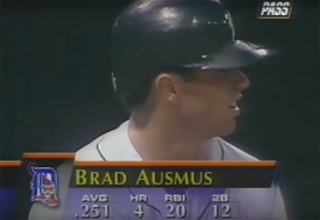 You don't even get to see his on-base percentage by looking at this card. It's actually not much different, except that they rolled slugging average into the OPS stat, and added WAR. Small steps, but also giant steps, I suppose. 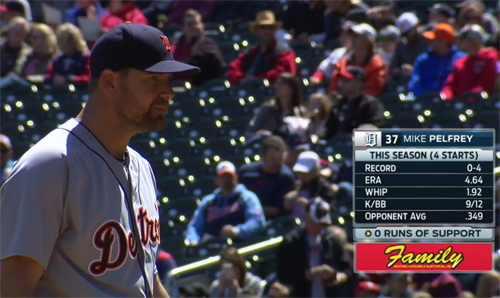 But forget baseball cards for a minute, because a far larger percentage of the baseball-loving population gets their statistical information via television graphics during the games. The first graphic gives you the triple crown numbers: batting average, home runs, RBI. The second graphic adds OPS, which is an improvement, albeit a slight one. So from the basic stats of starts, win-loss record, and ERA, we now also have WHIP, strikeout-to-walk comparison, and opponent batting average. The old statistics have a certain simplicity about them, which is probably also why they fail as useful metrics. They're too simple, they don't tell enough of the story. But they are simple, and that makes them attractive. I understand "wins" and "losses" on a pitcher's line, because winning and losing are the most basic of concepts in sports. I certainly understand "home runs" and "runs batted in" on a batter's line. Those are run-scoring events, and again, scoring runs is one of the most fundamental concepts in any sport. Knowing OPS and WHIP are helpful, but only if I know what they mean. What do those acronyms stand for? Even more importantly, what do those numbers mean in context? That graphic above says Mike Pelfrey's WHIP is 1.92 -- is that good or bad? Low or high? 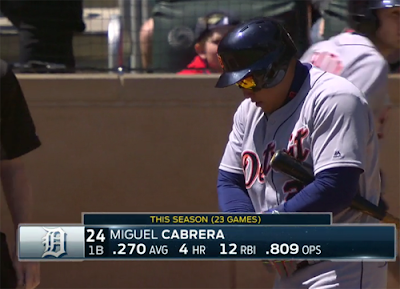 Miguel Cabrera's graphic says he has an .809 OPS, but is that average, above-average, or elite? Here's where the traditional stats can be semi-useful: when you're looking at them as surface-level, at-a-glance numbers to give you some kind of general idea of how a player is performing. A pitcher's ERA stat can't tell you whether he's getting lucky or unlucky, or whether his defense is either bailing him out or inflating his numbers, but it can give you a basic idea of where he sits. Extremes also help. Just look at some of the greatest pitchers of all time and their career ERA figures: Cy Young (2.12), Walter Johnson (2.17), Sandy Koufax (2.76), Bob Gibson (2.91), or Don Drysdale (2.95) -- those numbers don't happen by accident. Those were genuinely elite pitchers, and their incredibly low ERA figures point to that. Win-loss records are the same way. The more extreme the record, the more likely you're dealing with a pitcher who is having a legimately great season. Greg Maddux goes 19-2 in 1995; Max Scherzer goes 21-3 in 2013; Orel Hershiser goes 19-3 in 1985; Dwight Gooden and Roger Clemens go 24-4 in 1985 and 1986, respectively. Those were great pitchers having great seasons, as reflected by their incredible win-loss records. 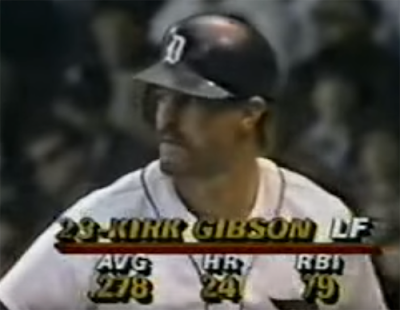 Batting average doesn't tell me everything I want to know about a hitter, because it's only telling me that he gets hits (or maybe he doesn't). It doesn't tell me how often he gets on base (which is just as valuable), and it doesn't tell me anything about his power, but it does tell me something about his hitting ability. Ty Cobb had an incredible 12 seasons hitting better than .370, and wouldn't you know it, he was actually a good hitter. Miguel Cabrera has had four seasons in Detroit hitting better than .330 -- turns out he's a decent hitter as well. It's when the batting average drops below a certain point that you want to start asking the other questions. Alex Avila only hit .218 in 2014, but his on-base percentage was .327, so he was definitely providing run-scoring opportunities. Another extreme example: Lou Whitaker hit .237 in 1990, but got on base at a .338 clip. It's not that these traditional stats are completely useless. They can serve as a kind of appetizer to the meal. 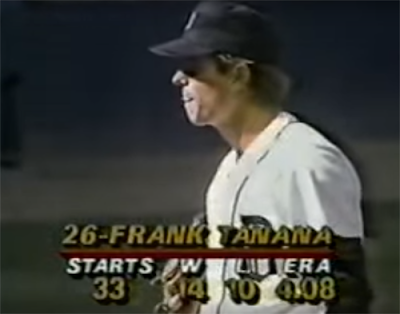 Traditional stats are like the old, toothpick-chewing gas station attendant in a strange town who gives you directions to the nearest highway. He'll get you in the neighborhood of where you're trying to go, but as you get closer to your destination, you might want to fire up the GPS just to make sure.